Calendar of Events - Benton / West City Area Chamber of Commerce. County, Illinois. Only one entry per immediate family. 2. 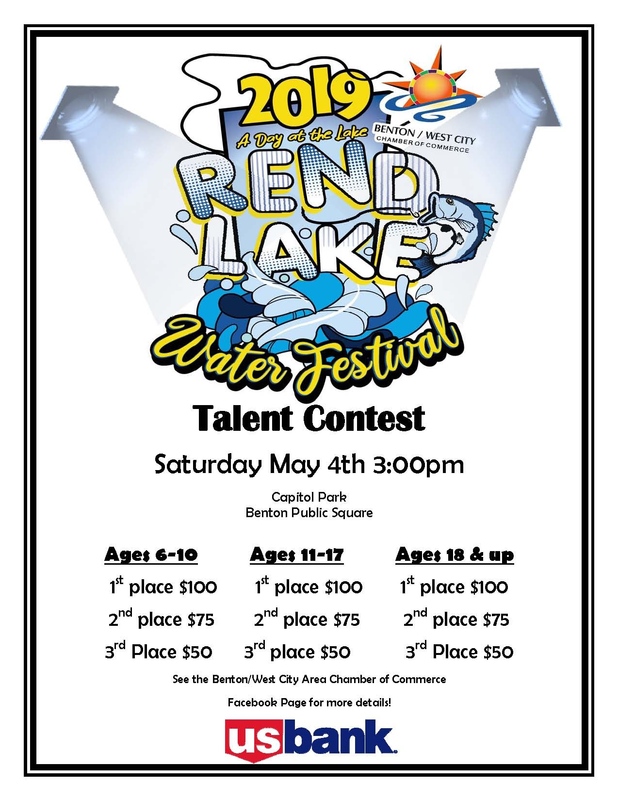 Age Divisions for pageant will be Ages 2-4, and Ages 5-8.
envelope for return of the picture, or they may be picked up at the Chamber office. 5. 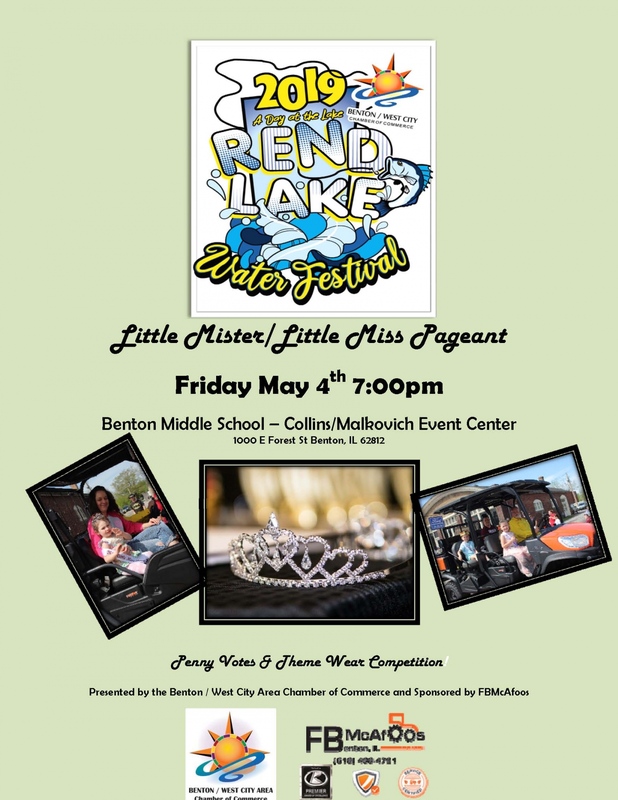 Attire for this year’s Pageant needs to be related to our Festival Theme “A Day at the Lake”. Participants can wear beach/lake themed attire. Sun hats, sun dresses, sunglasses, Hawaiian shirts, sandals, etc. This excludes Swimsuits. 6. Penny Votes and Theme Wear scores will be combined to determine the winners. media will get your child. 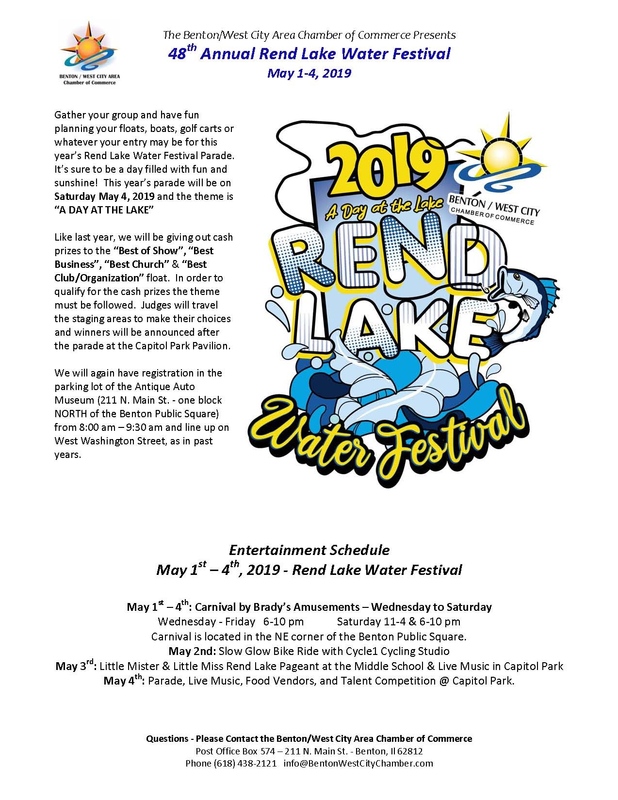 Gather your group and have fun planning your floats, boats, golf carts or whatever your entry may be for this year’s Rend Lake Water Festival Parade. It’s sure to be a day filled with fun and sunshine! This year’s parade will be on Saturday May 5, 2018. This year's theme is "Journey Through The Decades" so pick your favorites and relive the fun and excitement of yesteryear. Like last year, we will be giving out cash prizes to the “Best of Show”, “Best Business”, “Best Church” & “Best Club/Organization” float. Judges will travel the staging areas to make their choices and winners will be announced after the parade at the Capitol Park Pavilion. 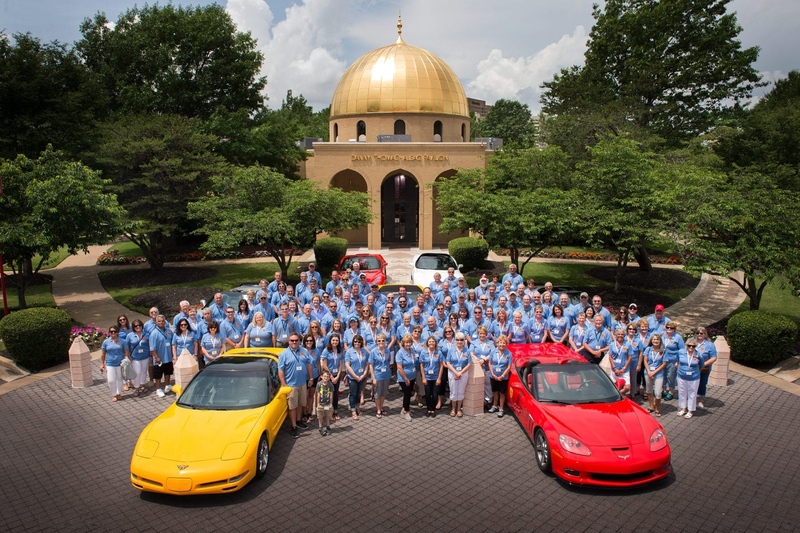 We will again have registration in the parking lot of the Antique Auto Museum (211 N. Main St. - one block NORTH of the Benton Public Square) from 8:00 am – 9:30 am and line up on West Washington Street, as in past years. According to the Illinois State Police, Concealed Carry Permit holders who took their original Concealed Carry class in 2013 or 2014, are now eligible to take their Concealed Carry 3-Hour Renewal Class. Graduates, however, should not submit their renewal application with renewal certificate until they receive their notice of original permit expiration from the Illinois State Police, usually within 90 days of expiration. This is the 3-hour Concealed Carry Renewal Class for current Illinois Concealed Carry permit holders. Per Illinois Concealed Carry Act Mandate, the class will consist of reviewing all laws associated with Illinois Concealed Carry followed up with a live fire range qualification. This is an approved curriculum by the Illinois State Police and this course meets the renewal mandates. neglect and other adversities can have across generations. settings, addiction and trauma focused behavioral health treatment. System of Care Committee Planning Meeting to follow from 5 – 7 p.m.
1-855-608-3560 ext. 7855 or Ginger Meyer at gingermeyer1@hotmail.com. This course will provide an understanding for the law-abiding citizen’s right to self-defense. The participants will develop skills and attitudes essential for the safe and effective use of a handgun for the protection of self and family. Further, coverage will be provided on mental awareness, how to avoid victimization, and mindset development for use of a firearm when faced with a life threatening encounter. This course will review basic gun safety rules for guns in the home, travel and concealed carry. Also covered will be the responsibility of firearm ownership laws, how to legally travel with a firearm and the justified use of lethal force. Students will be required to participate in classroom and firearms range activities and demonstrate basic live-fire handgun proficiency. This course is a condensed version of our 16 hour Concealed carry class strictly for Veteran's that will provide an understanding for the law-abiding citizen’s right to self-defense. The participants will develop skills and attitudes essential for the safe and effective use of a handgun for the protection of self and family. Further, coverage will be provided on mental awareness, how to avoid victimization, and mindset development for use of a firearm when faced with a life threatening encounter. This course will review basic gun safety rules for guns in the home, travel and concealed carry. Also covered will be the responsibility of firearm ownership laws, how to legally travel with a firearm and the justified use of lethal force. Students will be required to participate in classroom and firearms range activities and demonstrate basic live-fire handgun proficiency. Course meets all of the Illinois Concealed Carry Curriculum Mandates.